From 31st March 2017 the White Construction Related Occupations (CRO) CSCS card will no longer be issued. This means you will not be able to obtain this type of card after 31st March and any cards that have been issued will expire on 30th September 2017. The CITB think this will affect over 230,000 people who hold the White CSCS Cards. 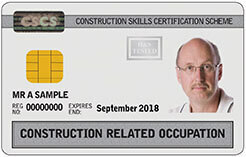 The change is being made because the CITB consider this CSCS Card is being used by people who are actually skilled trades and who should have a different card. Many of the people holding these cards will need to get the appropriate NVQ for their trade. Others will be transferred onto cards issued by one of the CITB’s partner schemes. I’m on a White CSCS Card! What should I do? You will find all the information you need to get your NVQ and your new CSCS card. If you are a Labourer but obtained a White card , see here. If you are in another trade Click Here (opens in a new window) to be able to check out the CITB’s “card finder service” and make arrangements to get the new card sorted out. Don’t forget – SuperSkills is always ready to provide FREE advice to help people make the right choice – whether you need an assessment we provide or just a helping hand!